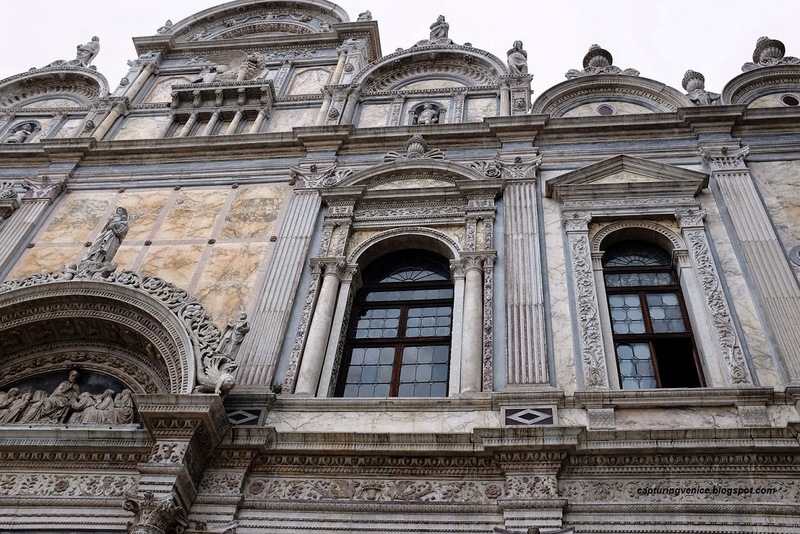 Founded in 1260, the Scuola Grande di San Marco was one of Venice’s original three scuole (you can read more about the scuole here). It was established in Santa Croce, and later moved to its present site near the church of Santi Giovanni e Paolo. In 1437, the Confraternity of San Marco built its new headquarters, but this structure was destroyed by fire in 1485. It was re-built from 1487 – to the mid 1490s by Pietro Lombardo who began the lower hall and façade. Lombardo was dismissed to be replaced by Mauro Codussi who completed upper façade and upper hall from 1490, and was responsible for the interior double-branch staircase. If you’ve visited the Accademia Galleries, you’ll remember seeing Tintoretto’s Miracle of St Mark and St Mark’s Body Brought to Venice – both were originally housed in this scuola together with The finding of the body of St Mark which is now in the Brera in Milan. The scuola was converted to a hospital under the Austrians in 1819, and remains Venice’s hospital to this day.